The Daphne Jackson Trust, which helps STEM academics back into research after a break of two or more years, taken for family, health or caring reasons, is urging psychologists to apply for its Fellowships. The charity offers flexible, part-time and salaried fellowships in universities and research institutes across the UK. We spoke to Dr Lucy Bates, who is researching elephant cognition, about how the Trust encouraged and supported her on the journey back into the world of academia. Bates completed a PhD in evolutionary psychology at the University of St Andrews studying chimpanzee cognition in Uganda. 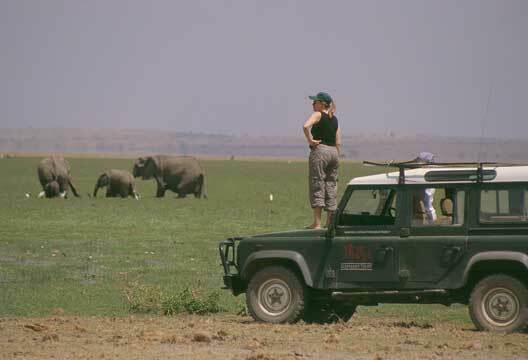 She then went on to join the longest-running study of African elephants at the Amboseli Elephant Research Project in Kenya for her postdoc research – also with St Andrews. Following this work Bates’s partner was offered a job in South Africa, and she went along to write up existing data and get experience working in conservation projects in the country. She said: ‘It is impossible to do animal field work and not get drawn in to conservation – the threat that there won’t be any wild animals left to study soon is horribly real!’ She spent time working with NGOs, and rather than answering questions about elephants it only opened up more. After four and a half years in South Africa, having her first child, she said while thoughts of returning to research had gone away, the questions she was hankering to answer hadn’t. While eight months pregnant with her second child she happened upon an advert online for a Daphne Jackson Fellowship, hosted and sponsored by the University of Sussex – one of the few psychology departments in the UK with professors studying elephant cognition. Although Bates’ Fellowship was advertised and fully sponsored in a specific STEM discipline and geographical location, the Trust also accepts applications on a rolling basis. In these instances, the Trust will secure sponsorship once a fellowship proposal has been approved and accepted by the Trust. Bates is now studying culture and potential social learning in elephants. ‘Elephants have very long periods of juvenile dependency, and it is frequently assumed that social learning must be a significant part of their lives, giving them lots of information that would be too difficult or costly to acquire on their own. But there is actually very little evidence for any social learning in elephants – probably largely based on the immense difficulties of demonstrating social learning outside of a lab, and elephants not easily fitting into labs.’ She and Professor Karen Mccomb (University of Sussex) are also hoping to get funding to expand this line of research. - If you’ve taken a career break of two or more years for family, caring or health reasons and would like to find out more about returning to research with a Daphne Jackson Fellowship, call 01483 689 166 to speak to Trust staff or visit daphnejackson.org.